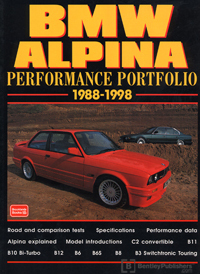 This BMW Alpina Performance Portolio: 1988-1998 is a collection of 34 original articles compiled from the pages of Road & Track. The information collected in these reprinted articles includes 6 road tests, plus specifications, touring and long-term reports. Alpina started in the mid-1960s as the purveyor of tuning accessories. By the time the first cars in this book were built they were a sophisticated entity and put together as a complete package by Alpina or, uniquely, by Sytner in Britain who assemble all the right-hand drive models. Alpina had only a brief flirtation with turbo charging because the company believed it lacked the refinement, which its increasingly demanding customers wanted. This is a collection of road and comparison tests with specification and technical data.